I apologize now for the madness you are about to enter into if you read this review. 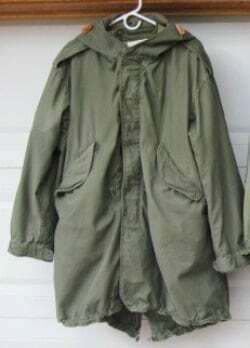 My madness started about 30 years ago when I first received a fishtail parka from a fellow Army Reservist in trade for some boots. The parka looked like a warm coat and I had some extra boots, why not. I wore that coat in the coldest, windiest, most miserable conditions Mother Nature could dish out for Colorado. It never let me down. I even used it when slept on the ground, against a tree, a friends floor, it was my blankie. He had it for about 10 years, he passed away last year and his wife returned it to me, it meant a lot and she knew it. The past couple of years my madness has grown and the return of this unique coat was even more meaningful, as you are about to learn. 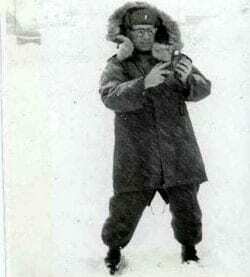 The M1951 Fishtail Parka was originally developed for our soldiers on the Korean Peninsula where winters can be brutal. It needed to be large enough to wear over a uniform and anything else that a soldier might be wearing or carrying. 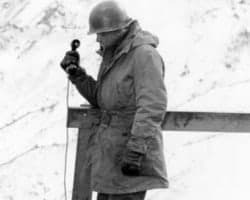 The original concept coat was designated M1948, they are rare and were made of the best materials available, not many were made due to the high cost. The M1951 saw some different materials being used, but were still expensive and heavy. They were made up until the mid to late fifties and were copied by some other countries. In 1965 they were brought back and called, get ready, the M1965 Fishtail Parka. I am not sure how long they were manufactured. During the first Gulf War a new version was produced in a Night Camo pattern, the idea was that it was supposed to mask the troops from older night vision optics, it did not, but it was a good piece of gear never-the-less. You can find pure white snow versions also. So the differences in years of models is basically this, the M51 has an attached hood and shoulder epaulets to stuff your gloves or other gear into. It has a button in liner that was made of alpaca or other wool or even a synthetic pile I have heard about but have never seen. It could have a button in hood liner also with fur trim. The cuffs have big buttons with elastic as well. The zipper is your standard Talon, self sharpening, unit. I say self sharpening due to the fact that if your get something caught in it, it just might shear it off, they are the best. The pockets, two slash style, are wool lined and have snap closures as does the front. Sizing is larger than any civilian sizes, remember they are made to go over your other layers. Material is 80/20 cotton and nylon. IMHO these are the best of the lot, because of the attached hood and they just look good. The M65 had no attached hood, but a separate unit can be buttoned on, and it came with a quilted button in liner. The hoods for this coat that I have seen are wool insulated with a hideous white fake fur trim, I removed the trim from my hood. The hood can be sewn on for a better look and less wind infiltration. There is also a wire brim on these hoods to conform to whatever you may be wearing. Up until now the hoods were large enough to fit over a helmet. These models have 2 large slash pockets lined with wool. These models are sized large, meaning a full size bigger than what you would expect from the military. The cuffs have a large button and elastic straps. Talon zipper with snap front, 50/50 cotton nylon construction. I have seen some that were 80/20 like the M51’s and some older versions with attached hoods. The Desert Night Camo models are a little different. They have an attached hood, 2 slash pass thru pockets, and the hood is smaller than a helmet sized unit. More like any standard hood would fit, but still large in nature. The sizing is smaller too, I would say a full size different than the previous models, but still voluminous. The liners for this are quilted nylon/polyester and have pass thru slots, no pockets on this model and no zipper, button front only. The cuffs have elastic with no buttons. The pattern is not too aggressive in nature and really doesn’t stand out in a crowd like most camo patterns. These are 50/50 cotton and nylon. I plan on doing an over-spray of Moss Green on one to see if I can make it look older and dirtier, going for a hobo look. The Snow Parkas are just overcoats, no pockets and no liner to button in. They are great for fitting over your normal winter clothing with pass thru slots to get to your gear underneath. These fit a size smaller like the Desert version, more like a regular military size, but once again, big by civilian standards. These are 100 nylon, so very waterproof. So, except for the snow version, these are not water tight coats. 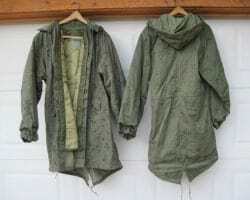 If you are stuck in a sleet storm or very rainy cold conditions these coats will soak up the water, put on your poncho. They can be sprayed down with water repellant with some success, but with that coating comes a more flammable unit. Everything is a trade-off. The older liners made of wool were heavy and when they got wet, even heavier and took a while to dry. I say stick to the newer quilted units and save any wool liners you have to sell for big money or for those days spent re-enacting M.A.S.H. scenes. M51 and M65 liners are all interchangeable, the Night Camo units are item specific. I hope I covered all the differences, if I missed something, sound off. So why are we talking about these coats? Glad you asked. They are durable, light for their size and coverage, and can be easily modified to hold more gear. The fabric is so strong you can sew extra pouches inside for gear. 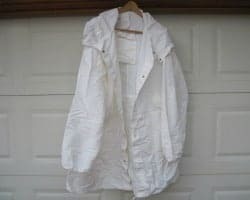 I heard of one person who sewed a large survival vest into one to create a cold weather survival smock. They don’t really look like some tactical piece, so you won’t stick out in a crowd. I can wear mine in 50 degree weather on a hike, keep it opened up and not over heat, but when the clouds come in and the wind picks up, zip up and be toasty. Granted I live in a dry clime and don’t have many humidity issues. When camping or just enjoying the cool fall evenings, when you wrap up in one of these, it feels comforting and makes you want to stay out a little longer. There are some great companies out there making some very versatile greatcoats, most are expensive, correct that, I haven’t seen a cheap one. Some can double as a sleeping bag. 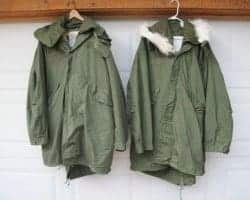 Others resemble an M-65 Field Jacket with lots of pockets, very neat stuff from a gear head’s perspective, but again be willing to shell out the dollars. 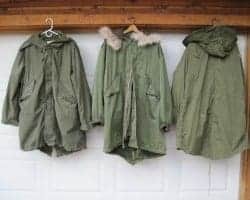 If you have ever thought about a great coat/over coat as a viable option, but couldn’t pull the trigger because of price, you owe it to yourself to do a little research on this military option. If you are handy with a needle and thread, this coat is only limited by your imagination. Inventory of these are getting tighter. M51’s are commanding top dollar, especially if they have the original liner and hood liner. M65’s are cheaper, but starting to climb too. The Desert version is still very affordable. The ones I have purchased are advertised as used, but appear to be just dusty. The Snow Camo ones are also very affordable and I believe you should all get one, if nothing else for playing a game of hide and seek with the kids in the snow. Bottom line, Fishtail Parka’s are a great coat with lots of survival applications!